In the planning stages of our trip to the Broken Islands in early September. Right now we are a couple canoes and a kayak. I really enjoy the planning part as it really helps ensure a successful trip. I know a few people on here have paddled the Broken Islands and would love any suggestions you may have. Thanks in advance. I paddled both the Broken Islands & the Deer Group last Sept & had a wonderful trip. Even our weather was great with mostly sun! 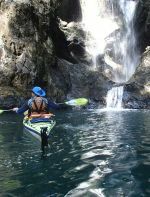 Depending on how much time you have, you could consider paddling both groups. Deer Group is just as beautiful & since it is not part of the park, it is free. We started at Toquart Bay (3 kayaks), after having been dropped off by Majestic Ocean Kayaking (no charge to park at Majestic). There is no water available at Toquart Bay, so make sure you have filled up ahead of time! We paddled to Hand I & camped there, then wandered to Turret I. & stayed a couple of nights there....took a day trip to Effingham & other outer islands. The wind usually picks up gradually through the day so any travel to outer islands is best done early. The next 2 nights we spent at Gibralter I. - very beautiful - lots of starfish of all colours & we even saw an octopus! On one of the days we paddled over to Sechart Lodge to re-fill our water. The fellow there is a bit odd, but didn't mind us filling up - but doesn't want any inter-mingling with paying customers. This is the only place I know of to get water while underway in the islands. In order to cross over to the Deer Group, we took a roundabout, beautiful & mostly protected route along the coast - didn't want to make the long open crossing across the Imperial Eagle Channel. Instead we went from Nettle I. to the Julia Passage - very interesting with 'houseboats' there, from there crossed to Palmer Pt. & then crossed Vernon Bay. There is a long beach there where you can camp. From there we simply followed the shore to Deer Group. If you go to the Deer Group make sure to include Stud Islets, an absolutely beautiful little group of islands. Our final camp was on Diana I., where we had pre-arranged to be picked up, again by Majestic. They don't themselves to the pickup, but they have contracted it out to an excellent fellow (ex fisherman) who also runs a B&B with his wife. It's a very beautiful, interesting & always changing area out there. I am currently planning a 2nd trip for this summer - to explore Clayoquot Sound. Short answer - we loved it. marscanoe, Deer Group sounds interesting. May look at that IF the rest of our group is interested, especially the roundabout way you got there to could avoid Eagle Channel as we will all be in canoes.